To honor its Japanese roots and commemorate a decade of success in the United States, HI-CHEW™ invites fans to vote on which flavor they want launched in 2019. (Irvine, California) March 12, 2018— Today, Morinaga America, Inc., manufacturer and distributor of the popular soft candy HI-CHEW™, has launched an East Meets West Flavor Challenge. The challenge invites candy fanatics to participate in choosing which unique Japanese HI-CHEW™ flavor they would like to see available in the United States in 2019. Since the parent company of Morinaga America, Inc., Morinaga & Co., first launched HI-CHEW™ in 1975, the product has been available in over 170 flavors. For the first time, American consumers will have the opportunity to cast their vote and select from a list of exotic HI-CHEW™ flavors including Banana Fizz and Strawberry Cheesecake. Voting begins today on www.voteeastmeetswest.com and runs through March 31, 2018. The winning flavor will be revealed on April 10, 2018 and will be available for United States consumers to purchase next spring. The East Meets West Flavor Challenge pays homage to the brand’s Japanese heritage and its success over the past decade of growing HI-CHEW™ in the United States. Taichiro Morinaga originally traveled to the United States to learn the secrets of candy making in the late 1800s before returning to Japan to establish Morinaga & Co., now a leading confectionary and frozen desserts manufacturer. The spirit of Taichiro Morinaga returned to the United States in 2008, which brought the founder’s love for sweets back to where it all began. 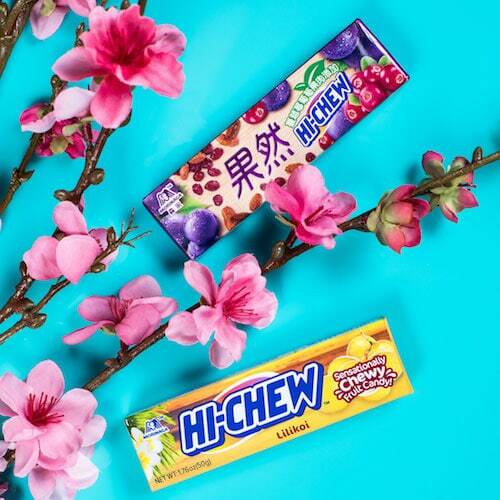 Since HI-CHEW™ first launched in the United States 10 years ago, Morinaga America, Inc. has experienced year-over-year double- digit growth, a testament to the “can’t-get-enough” chewy candy. Today, 22 pieces of HI-CHEW™ are eaten every second. That’s 1,320 pieces per minute, 79,200 pieces per hour, 1,900,800 per day and almost 700 million pieces of HI-CHEW™ per year! In Japan, it is considered impolite and somewhat taboo to remove food from one’s mouth. This is why HI-CHEW™ was originally created in 1975 as a substitute for chewing gum. It quickly became an instant success across Asia and has since launched internationally because of its true-to-fruit flavor offerings and one-of-a-kind chewy texture. HI-CHEW™ flavor concepts begin through a very careful and detailed research and development process. Qualitative and quantitative research is conducted to identify consumer wants and trends within each market. Once demand is identified, HI-CHEW’s team of flavor experts create multiple rounds of flavor profiles to achieve the most real fruit flavor options. Offerings are particularly selected according to consumers’ palates. Through the East Meets West Flavor Challenge, consumers will choose from 20 Japanese flavors to determine which one has what it takes to make it here in the United States. Fans will pick from fruit-forward flavors like Watermelon, Cantaloupe, Dragon Fruit, Lilikoi and Lychee, as well as dessert-like offerings such as Cotton Candy, Strawberry Cheesecake and Chocolate Covered Banana. Every vote counts! To learn more about the East Meets West Flavor Challenge and to enter your vote, please go to www.hi-chew.com. You can also like us on Facebook, and follow us on Instagram (@HICHEWUSA) and Twitter (@HICHEW). Established in 2008, Morinaga America, Inc. is the official manufacturer and distributor of HI-CHEW™ in the United States. With over 170 flavors of HI-CHEW™ having debuted in Japan, Morinaga America, Inc. has introduced the United States market to the best of Japanese confectionery. Morinaga America, Inc. (marketing and sales) and Morinaga America Foods, Inc. (manufacturing) are wholly owned subsidiaries of Morinaga & Co., Ltd., which began in 1899 as the first, modern candy maker and producer of chocolates in Japan. In 2015, Morinaga America, Inc. opened its first United States manufacturing facility in North Carolina. The history of Morinaga stretches back over a century, when company founder Taichiro Morinaga brought his candy making skills to Japan from America in the 1800s. HI-CHEW™ has long been the best-selling soft candy in Japan and continues to see year-over-year growth throughout other parts of Asia and in the United States. In the United States, HI-CHEW™ is currently offered in the following flavors: Strawberry, Green Apple, Mango, Grape, Banana, Melon, and Kiwi. HI-CHEW™ also offers Sours in Lemon, Lime and Grapefruit and Fizzies in Cola and Orange Soda. HI-CHEW™ is made with real fruit juice and purees and is 100% free of gluten, cholesterol and artificial colors. HI-CHEW™ continues to expand fruity, chewy flavor offerings annually.